To help Inlight Entertainment create this handheld game, Markus created shaders for existing models and also created new model assets. Markus built the shaders shown on the race cars above. Markus modelled and textured the vehicles shown below. 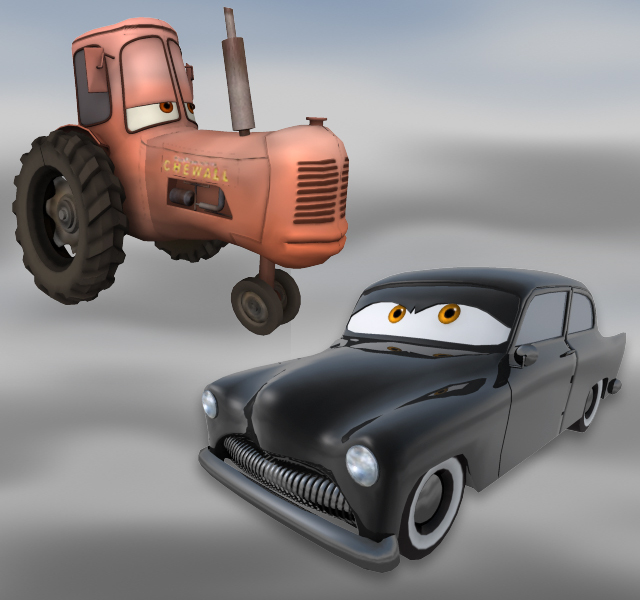 The tractor design is based on Pixar drawings. The mob car is a vehicle unique to this Cars 2 game and was designed by Markus. Markus received untextured models for three race cars and created custom car-paint shaders using Mental Ray and Photoshop. The tractor model was built based on very minimal reference received from Pixar. The mesh included deformable lips so that the tractor could be posed with different expressions. The mob car is unique to this game and was build from Markus' own design using NURBS and custom car-paint shaders.